After the process of designing a premises cabling network is completed, the next step is to install it. What do we mean by the “installation process?” Assuming the design is completed, we’re looking at the process of physically installing and completing the network, turning the design into an operating system. The goal is this lesson is to learn the process of preparing for the installation, getting proper training, safety and then doing the actual installation work. Congratulations! 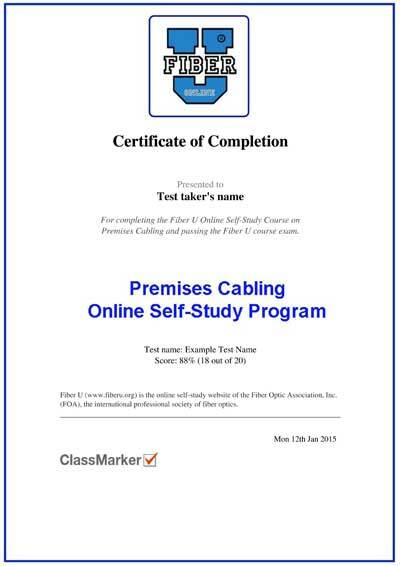 You finished the Fiber U Self-Study Program on Premises Cabling! Now you can get your "Certificate of Completion" online. Now you have completed the Fiber U Premises Cabling online self-study course, you can take an online exam and, when you pass the exam, get a "Certificate of Completion" for this course. You should have completed all lessons including taking the quiz ("Test Your Comprehension") at the end of every lesson. When you think you are prepared, you can take an online exam for a nominal fee ($20) which will give you a "Certificate of Completion" for this course.